Want to Cultivate New List Members? Skip the Small Talk! Thinking about sending out a carefully crafted welcome message to help introduce new list members to your organization and get them engaged in your work? Better think again! If your goal is to cultivate good activists and/or donors, it seems you might be better served by skipping the “welcome” message(s) altogether. Data from tests we recently conducted for several of our nonprofit clients has shown that “welcome” messages are not the most effective first communication for new subscribers. It might seem way too easy, but it appears that a typical action alert or fundraising appeal on your most current, most compelling issue/campaign is far more effective at engaging new list members – and retaining them – than a well-crafted welcome message! If your goal is to cultivate good activists, I strongly recommend sending new recruits an action alert within their first week on your list. Make a good first impression and make it fast. The first few weeks that a new subscriber is on your list represent a golden window of opportunity: List members are most receptive and responsive to communications from your organization in their first six weeks on your list. We consistently find higher open rates for the first message people receive than for subsequent alerts. That’s why it’s critical to move fast and really make that first email count! The same exact rules apply when it comes to cultivating donors. If your goal is to build a list of donors, make the first message new recruits receive from your organization a fundraising appeal. And send it within their first week on your list! Keep in mind that this first fundraising appeal is likely to receive a far lower response than a first action alert would (as is true of any fundraising appeal) and is obviously not a good way to generate actions but it will help you raise more money over time. The data below shows the results of a test conducted with three equally and randomly split groups of new subscribers to an environmental group’s email list. All the subscribers were recruited via a petition for a Roadless Forest campaign. The longer welcome series actually made list members more likely to unsubscribe. 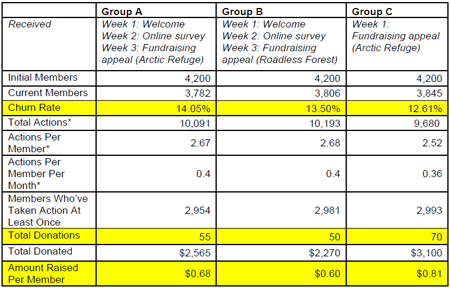 Also, the members of Group C that received a fundraising appeal as their first message from the organization made more donations overall than the other two groups. Although the other two groups did not receive a fundraising appeal as their first message, they did receive one as the third message in the series, so each of the three groups received the same number of fundraising appeals. The welcome message included a request to take action via an online petition in addition to some information about the organization and what to expect as list members. * Does not include actions from welcome message. *The difference between the three groups in terms of actions taken is not statistically significant. But I Want to Cultivate Activists AND Donors! Given that the combination of advocacy and fundraising is a powerful and effective one for many groups, it’s quite likely that your organization wants to cultivate both activists and donors. Unfortunately, I am not yet aware of a single magic formula for this. Try to think of it as a continuous balancing act. I suggest that you weigh your organizational priorities (do you need to collect as many public comments as you can before the comment period closes or are you desperately trying to reach a certain monetary goal before a matching gift offer expires?). Also consider the relative strength of your advocacy and fundraising asks at any given time (if you have an incredibly powerful advocacy campaign but only a generic fundraising campaign, go with the action). And try to stay flexible. If your colleagues are uncomfortable with the idea of sending either a fundraising appeal or an action alert as the organization’s first communication, propose a test with a subset of people to make it seem less intimidating. Don’t be afraid to play around with the sequence and timing of the messages you send to your new list members. For example, you could try sending them an action alert and following it up with an appeal a week later, or vice versa. If you or others on your staff are concerned about over-messaging your new subscribers, you could start with an action alert and follow up with the people who took action by sending them an appeal requesting donations to support some aspect of that particular advocacy campaign. 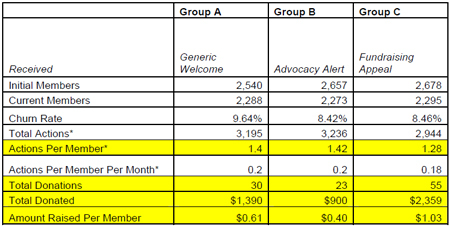 Check out the data below from another recent test to determine the impact on advocacy and fundraising response rates of sending a generic welcome message versus an action alert versus a fundraising appeal as the first communication. 1. It does not appear that receiving a fundraising appeal as their first communication has had a hugely negative impact on Group C’s response rates to advocacy campaigns. 2. It does appear that receiving a fundraising appeal as their first communication from the organization has made Group C significantly more responsive donors than either Groups A or B. 3. It does not appear that receiving a fundraising appeal as their first communication has made Group C more likely than Groups B or A to unsubscribe from the list. eNonprofit Benchmarks Study. The eNonprofit Benchmarks Study is the first-of-its-kind look at the effectiveness of major American nonprofit organizations using the Internet to raise money and influence public policy. The study is a tool that nonprofits can use to measure and compare their online performance to other organizations’ online programs. The study offers lots of valuable information from a variety of groups in an easy-to-read format. The Mercifully Brief, Real World Guide to Raising Thousands (If Not Tens of Thousands) of Dollars With Email. This new book with useful advice by Madeline Stanionis, president and creative director of DonorDigital, also recommends sending an invitation to donate to new recruits within their first week on an email list.